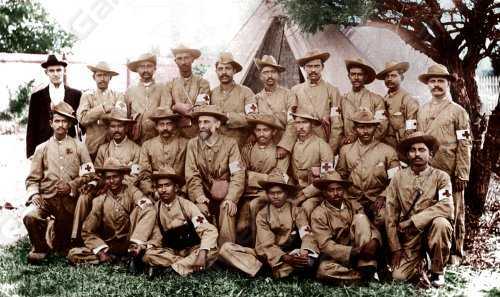 Mahatma Gandhi (middle row, centre) with the Indian Ambulance Corps during the Boer War in South Africa, 1899-1900 Standing: H. Kitchen, L. Panday, R. Panday, J. Royeppen, R.K. Khan, L. Gabriel, M.K. Kotharee, E. Peters, D. Vinden, V. Madanjit. Middle Row: W. Jonathan, V. Lawrence, M.H. Nazar, Dr. L.P. Booth, Mahatma Gandhi, P.K. Naidoo, M. Royeppen. Front Row: S. Shadrach, "Professor" Dhundee, S.D. Moddley, A. David, A.A. Gandhi.